PROBLEM: the stupid screw was really stripped, I could not get traction at ALL. Why that thing is made of brass I have no idea. It felt like I had pushed on it too hard and maybe bent some threads or something. Regardless, my first thought was to spray it with PB Blaster, let it soak, the tap a screw driver into it with a hammer to see if I could get it turning. Then I remembered that too much pressure was what started this mess to begin with, so I nixed that idea. I did hit it with some PB Blaster, though. Well, I've turned wrenches for fun for a while, so this is not my first stuck screw. Thought about using a torch, then I thought about the gasoline and maybe catching myself on fire- no go. 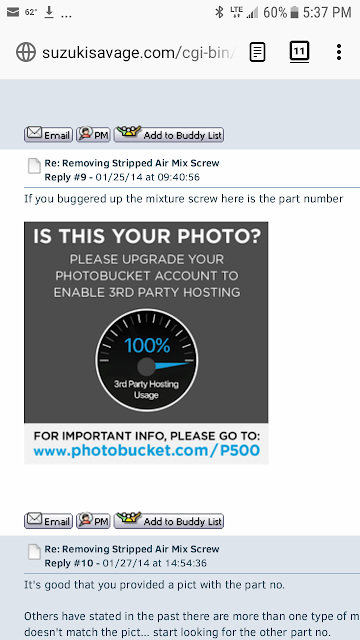 I tried my set of Probit Extractors- which normally work like a champ- but they would not reach the screw. I considered grinding down the metal around the screw to get access, but reserved that as a last resort. I was finally faced with saying screw it (haha) and buying a new carb, but that was not financially reasonable. I would take it to a machine shop, but I don't want to be THAT guy, and even a machinist could jack it up good. I prefer to break my own stuff. All the normal options were eliminated down to trying to drill it out. So I did, and it worked. First, I used a power drill and a 1/16th kobalt bit to start a pilot hole in the center of the screw. This was pretty shallow, but I then stepped up to a 5/64 drill bit and made about a quarter-inch deep hole . So far, so good. Then, I used a T8 torx bit (quarter-inch drive) and very carefully used a hammer to tap it securely into place. MAKE SURE YOU DRILL AND TAP THE BIT IN STRAIGHT. 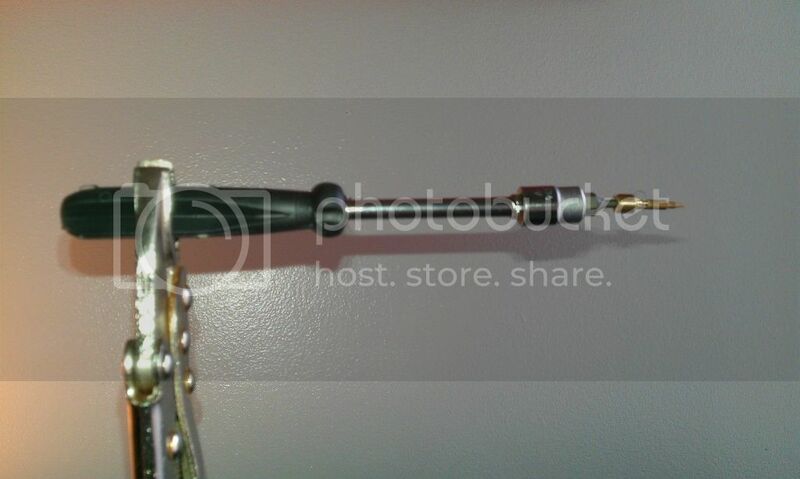 I did not have a ratchet that size, so I used a quarter-inch drive screwdriver and clamped onto the handle with a pair of vice grips for leverage (You WILL need to do this. Trying to crank it by hand without the added leverage is NOT going to work.) Then I said a little prayer, applied gentle, steady pressure and... it came out like a champ. Hopefully the pictures post below. Okay, that worked. Sorry if I was long winded. If you are not comfortable drilling metal, I WOULD NOT ATTEMPT this. You kinda have to be willing to completely toast it if you mess it up. Just be sure to drill the hole straight and use easy pressure. You probably only have one shot at this method, unless you step up the torx bit size. Not sure what other methods might have worked. I know there are screw extractors that work like the torx bit I used, but the concept is the same. Hope it helps! One thing I forgot to mention: I had the carb held in a table top vise while I did this. Trying to do everything without it secured is asking for trouble- unless you have a third hand or something. If someone is considering this, you may want to try using left-hand twist drill bits to do the drilling. dmj13, the Torx bit method worked. 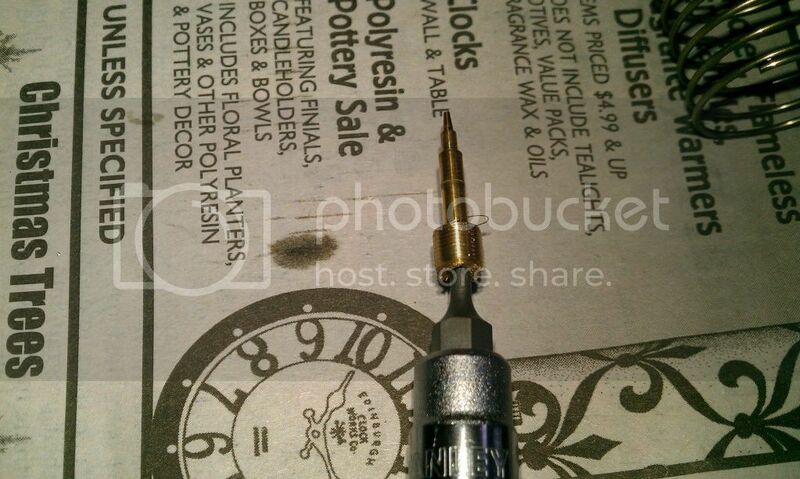 I used a 3/32 (2.4mm) drill bit and not the T8 but the T10 Torx bit. I also filled the recessed hole with WD-40 (only thing I had on the spot) and slowly applied pressure twisting left and right till the screw moved and then screwed it out. 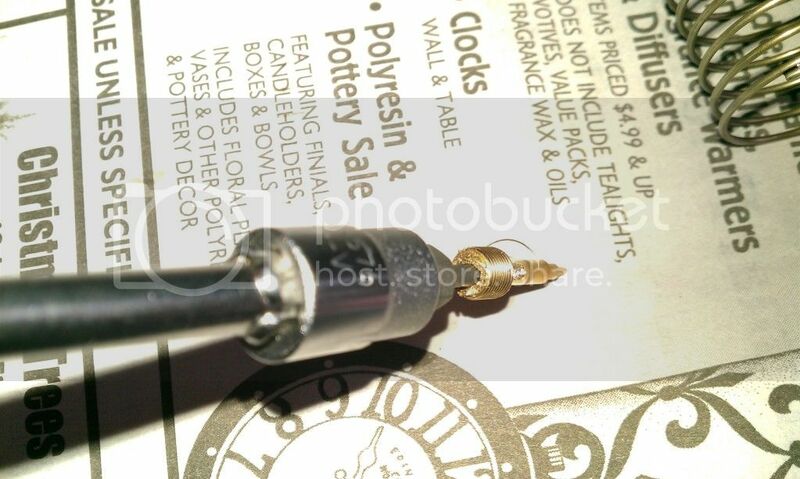 When i drilled out the brass plug covering the mix screw, the drill bit bumped the head of the screw dishing it. that didn't leave alot of meat for a screwdriver to grip (which is pretty shallow to begin with). I was dialing in the idle circut one crisp November day to eliminate the labored idle and hesitation at take off when the fated slot disappeared. I had taken a drill bit about the same width of the screws slot and carefully drilled a new slot. That worked, but buggered again shortly after and I tried to tap a screwdriver in the remaining portion of the slot and really messed the screw up so bad it froze in place. 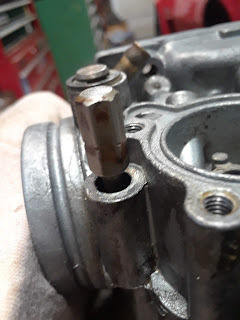 After I bought a new screw from the dealership and examined it, dmj13s removal idea seemed the best course to try with what I had left before running into the shaft of the screw. After the new screw was in place and bottomed, on the lip of the recess I made a witness mark (a light tap on a chisel) inline with the slot for a reference point. 2005 Suzuki S40 Boulevard, Lancers VM 36 Carb Kit & Thrush Glass Pack... Zoom Zoom! Just did this but with a 2.5mm drill bit and a t10 torx which I had to upsize halfway. Managed to do it with carb still on bike. Man I'm glad that thing is out, cheers. Has anyone identified a replacement screw with an extension and easy twist knob? 97 Savage - Blue Collar Bobber'd, Raptor petcock, 6" FC on deck, VerSlavy waiting list. Thanks for the solution guys. It worked like a charm. I turned it out, but I couldn't get the torx bit out of the screw very easily. Then I got a new screw and put it in. When I lightly (and I mean lightly) seated it, the brass noticeably started to strip. So I took it out and put the old one in with the torx bit still stuck in it. I figure if I can't pull it out with my hands, it won't vibrate loose from the engine. The perk is that I can just turn it with my fingers or a pliers. I would almost recommend this even if your screw hasn't stripped yet because you know it will. It's good that you provided a pict with the part no. Others have stated in the past there are more than one type of mixture screw for the savage. If yours doesn't match the pict... start looking for the other part no. I am so thankful for this post! Yeah, except I cant see pic! I get some photobucket B.S. I have put a 1/4" bit screwdriver on and tried turning, still stuck! Im not a WEAK man, i break nuts! Im afraid to put a ratchet or vice grips on the handle of the bit driver! It has had PB Blaster on it soaking and its soaking again. Ive gently taped the carb body around mixture screw. In my mind the bit SHOULD strip in the brass screw, OR the screw moves, BEFORE the bit breaks in the screw, but that AINT my luck!! !